He eats jam and toast while sitting in his gorgeous Tehran apartment awaiting the results of his appeal. A camera is strategically stationed to record his life, including his phone calls, his latest movie idea and the huge but playful iguana that crawls up to his neck for a hug. Jafar Panahi, like great artists, cannot suppress his creative drive. Every moment on tape has multiple meanings. Indeed, like Shakespeare’s “All the world’s a stage, and all the men and women merely players,” he lives in front of the camera the circumstance of his life. In telling his latest idea for a film, forbidden by authorities in Iran, we see the reflection of his own life predicament. There is a girl who has been accepted to an arts college. The honor was written up in the newspapers where her parents read about it. They locked her up in the house so she can’t make the registration deadline. In her bedroom the phone rings and it is her parents. She gets so mad at their words (to which we are not privy) that she slams the phone down on the floor and it shatters to pieces. It rings again. Startled she tries to put it back together, but she can neither answer nor reassemble it. Communication is irretrievably blocked. A long sturdy rope dangles to the floor from the center ceiling of the room. Her family put it there for her. Just like her future has been cut short, so has Panahi’s. He has been under house arrest since Dec. 2010 pending his appeal. He has been sentenced to 6 years in prison with a 20-year quarantine on filmmaking and interviews and lifetime ban from leaving Iran. The charge? “Assembly and colluding with the intention to commit crimes against the country’s national security and propaganda against the Islamic Republic” (Wikipedia). Even though Panahi is 52 years old, he has made only six feature films. His first two starred children and did not catch the eye of the strict Iranian censors. But since then, as all his works reflect the environment around him, he has inescapably found that his films reflect humanitarian issues for children and women in his country. Every film, though banned in Iran, has won critical acclaim and prestigious awards including three high honors from the Cannes Film Festival. In December 2012, he and an Iranian human rights lawyer were given the Sakharov Prize for Freedom of Thought. Like several other award events, he was unable to attend the ceremony. How did this prohibited non-film make it out of Iran? It was smuggled out on a thumb drive hidden in a cake 10 days ahead of the Cannes Film Festival as a surprise entry. 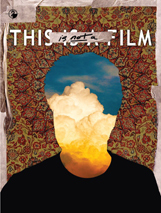 In December, “This Is Not a Film” was nominated as one of 15 Oscar contenders in the Best Documentary Film category for the 85th Academy Awards. With such luminaries as Sean Penn, Steven Spielberg, Martin Scorsese, Harvey Weinstein, Barak Obama, Ang Lee and Robert Redfern already campaigning against his censorship and sentence, this little non-film may get the Oscar nod to make a worldwide political statement. For sure it will end up as one of the top 5 Oscar contenders, not because it is so brilliantly executed, but because its message for artistic freedom is the centerpiece of cultural progress and social justice. Your review intrigues and frustrates me. I definitely want to see this “video essay.” I abhor the censorship it portrays. Jafar Panahi needs to be known throughout the world, then maybe, a very big maybe, he would be allowed more freedom in his own country!